Starring: Guy Pearce, Robert Pattinson, Scoot McNairy, David Field, Tawanda Manyimo, Gillian Jones, Jamie Fallon, Susan Prior, Anthony Hayes, Nash Edgerton, Richard Green, Ben Armer, Gerald Coulthard. After the surprise success of his Australian family crime drama Animal Kingdom, David Michôd became a highly anticipated new director overnight. It opened to rave reviews with Quentin Tarantino himself reportedly ranking it his third favourite movie of 2010. The most familiar face onboard was Guy Pearce but it also introduced many cinema goers to the fresh and vibrant talents of Joel Edgerton, Ben Mendelsohn and Jacki Weaver. Now four years later, Michôd’s back with a post-apocalyptic road movie working from a story he collaborated on with Edgerton and allows Pearce to add another solid role to his resumé. Ten years after an economic collapse, modern society has been brought to it’s knees. 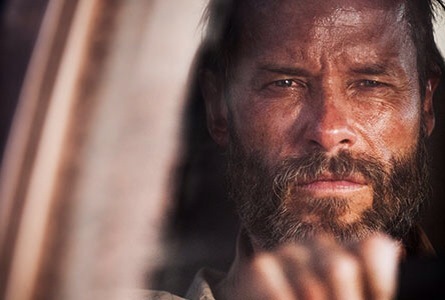 Travelling through Australia is Eric (Guy Pearce) a former farmer with a violent past. When his beloved car is stolen by a gang of thieves Eric goes in pursuit and will, seemingly, stop at nothing to get it back. 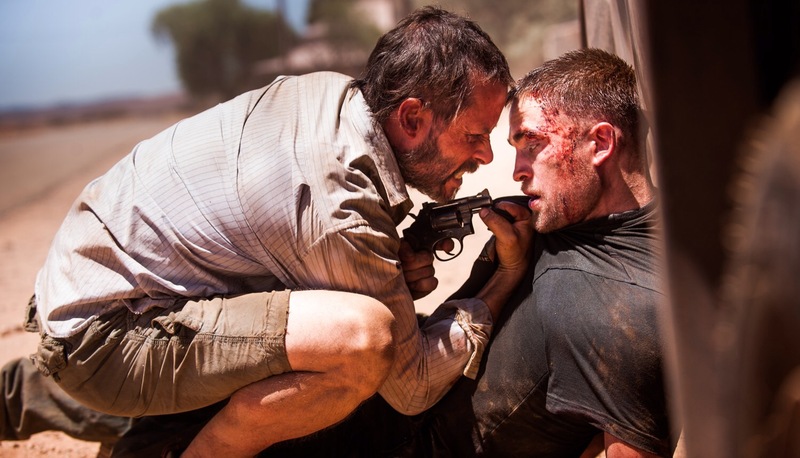 When exploring the Australian outback in a dystopian setting one would be forgiven for thinking of George Miller’s Mad Max in 1979 but as that film had fantastical elements and caricature villains, Michôd’s The Rover is an altogether different beast. It’s no fantasy and any form of humour only comes in the blackest of dialogue. This is a near-future economic collapse that’s so bleak that images of people crucified to telegraph poles is just accepted and dogs are kept in cages just to keep them alive. It’s grim stuff and Michôd seems to wallow in it. He’s also in no rush to reach his destination; the story is ambiguous, the pacing deliberate and some would even complain that it lacks any form of narrative drive. However, it’s nihilism can be strangely captivating and it’s so well shot by cinematographer Natasha Braier that’s its hard not to find some beauty in it’s stark landscapes. Throughout it’s periodic lulls, it’s held together by it’s two excellent central performances. The always reliable Pearce is a snarling menace of a man who has adapted to survive in this environment at the cost of his own soul. And Pattinson. Yes! Twilight pin-up, Robert Pattinson, surprisingly, holds his own. I expected to be critical of him but he delivers revelatory work as a dim-witted tag-along complete with facial tics and nervous energy and I’m sure his work here will silence many of his critics (myself included). Where both their performances excel is actually in their eyes. They deliver the requisite empty and dead-eyed stare of men who have been reduced to nothing more than barbarism. That barbarism comes in sudden bursts of mindless violence that jolt you out of your seat and the gun shots, bullet wounds and deaths all have a palpable sense of realism. Despite the marvellous performances, striking appearance and visceral approach, though, the story lacks depth and if it did have a consistency beyond veiled existentialism then I must have missed it. Essentially, there isn’t really a story but it’s the ending that will no doubt make or break a viewer’s experience. Either you’ll feel convinced and that it has meaning in exploring the last vestige of hope and decency from a desperate and broken man or you’ll feel robbed and that the steak you thought you were savouring for an hour and 45 mins turns out to be just an old piece of leather. It’s entirely up to you. Much like the the hair style of Pearce’s character, it’s patchy. But it’s hard to take your eyes away. I can’t honestly say why I liked it, I just know I did. Trivia: David Michôd wrote the character of Eric specifically for Guy Pearce. Originally Michôd and Joel Edgerton were to do the screenplay for Edgerton’s brother, Nash, to direct the film. This entry was posted on January 14, 2015 at 3:40 pm and is filed under Crime, Drama. You can follow any responses to this entry through the RSS 2.0 feed. You can leave a response, or trackback from your own site. Great review man. I get what you’re saying. A defined story is really secondary here. It’s more of a survivalist character study. What makes these men who they are? How far will they go? What is it that drives them? Is there any love, hope, or compassion left in that world? Those are the kinds of questions that filled my head as I was watching “The Rover”. It thoroughly engaged me. You’re also right about the ending. Some have dismissed it, but I think there is a much deeper meaning to it. I kinda felt that the story did need more meaning and at first I wasn’t keen on the ending but it grew on me. As a character study, though, it was strong and the performances were superb. I liked the film a lot and it definitely didn’t deserve the backlash it received from many people. As a result, i was very happy to see you praise it so highly. Sounds good, I do want to see this as I’m hearing so much praise for Pattinson! Pattinson is marvellous, mate. Really good performances from both him and Pearce. The film itself has frustrated many but it, for the most part, it worked for me. Definitely worth a watch. Cool, I’ll try to rent it out at some point soon then. I have to say I’m intrigued to see it. A very dark, eerie and creepy movie, yet, its style begins to work wonders for it later on as the story develops into being a whole lot more odd. Good review. Cheers Dan! It certainly had plenty of style and it was really well shot and acted. The story was a bit odd and didn’t entirely work for me but I still really liked the movie overall. “Much like the the hair style of Pearce’s character, it’s patchy” Ahah, that line made me laugh Mark! Y’know, after seeing the trailer the first time around, it seems too relentlessly bleak and violent for me man, I dunno, I don’t think this is for me. Knowing your tastes a little, Ruth, I’d reckon you wouldn’t be missing much from this. It’s inpressively delivered but very bleak indeed. Robinson helped elevate this one for me man. He was, as you say, revelatory as this rather unintelligent fellow who was only trying to get by. 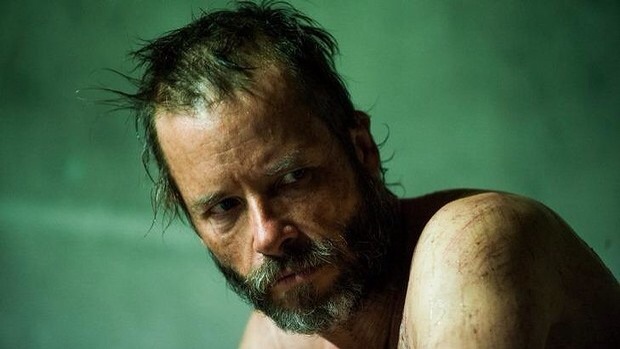 Guy Pearce was incredible. Loving that guy more and more with each role I see him in. 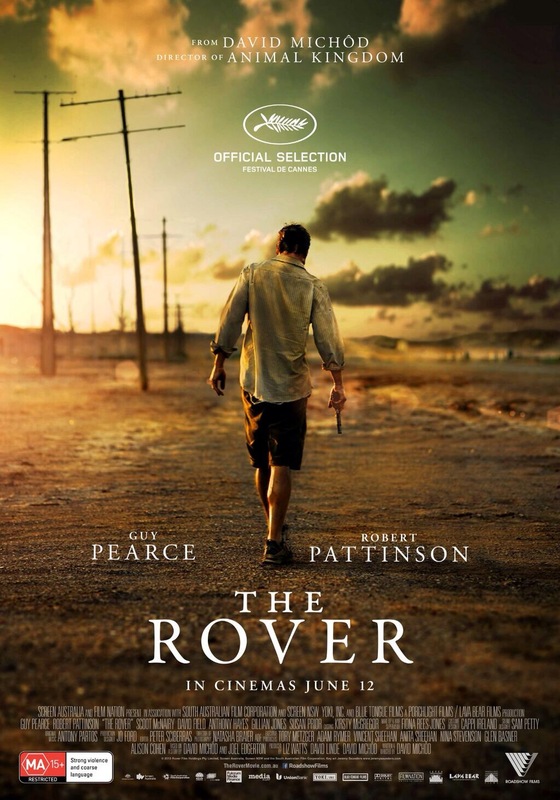 ‘The Rover’ is certainly an unusual little diddy; I appreciated the atmosphere, the performances and its unflinchingly, bitter disappointment in the human race. It’s a nihilistic film for sure. Not everyone’s bag. I can appreciate that about it too. Pattinson was superb wasn’t he? I was very impressed by him and Pearce was as solid as ever. The film really benefits from both these guys. They deliver excellent work which makes the lack of narrative all the more tolerable. Definitely a performance-based film. Although I enjoyed the brutally dark tone as well. I’m not very experienced in Australian film but this was a good start for me. I must see ‘Animal Kingdom’ soon! I loved the dark tone as well. I’ve seen Animal Kingdom but to be honest, I’d have to see it again. I got caught up in the hype at the time and didn’t think it was as good as so many were saying. Now that my expectations are lowered, it’s time for a revisit. Lovely job Mark. Still haven’t caught up with this yet but this sort of movie is right in my wheelhouse. Plus Pearce is akways great to watch. If you’re fan of Pearce (as I am), you’ll thoroughly enjoy his work here, Mark. He’s absolutely brilliant and Pattinson is his equal, believe it or not. It’s not a perfect film, mate, but very effective nonetheless. Great work Mark. I actually caught this over the weekend. Pattinson is not the dreadful actor that people paint him to be. I felt so much pity for his character in this movie. I liked this movie, but I didn’t love it, I agree wholeheartedly about the story being hollow. Like you, I cannot say precisely WHY I liked it. Pattinson was a revelation, Zoe. I was very surprised by how good he was. He really took me aback. I wasn’t overly impressed with the story, though. That said, the film was brilliantly handled and I found myself really entering into it all. Yeah the story did come in a bit too short for me, but the performances and the look just worked! The Road is one I’d, honestly, have to revisit. I wasn’t overly impressed with it when I saw but I was agreat admirer of Cormac McCarthy’s novel. I often find myself criticising film adaptations of books that I love, though. Thats aside, in terms of visuals and narrative, you vould say this had similiarities to John Hillcoat’s film. As a fan of The Road, I think you’d really take something from this, Jim. Ha, patchy, I’ll have to remember that. Interesting review Mark, heard many good things about this. Its a good film, Vinnie. Many didn’t like it but I think it’s been unfairly criticised to some extent. Haven’t seen this yet Mark, but I’m glad to hear it has something to offer. Has the look of a gritty, moody drama/thriller and I normally quite like those. Top work mate! Cheers, my man! This is definitely a moody, atmospheric piece with loads of style. Whether or not you appreciate the substance is another thing but the film is beautifully filmed and acted nonetheless!